Authored by acrouthamel on Nov 13 2018, 3:37 AM. "Like" token, awarded by davidc. used by users, making it easier and faster by default to access files. I take it you didn't run ctest. :) The kfileplacesmodel test will need adjustment. It may be painful. You may regret your life choices. ngraham added a subscriber: elvisangelaccio. Oh, this doesn't actually have any effect on the test since the item is only created conditionally, and the testing environment's homedir doesn't create the XDG dirs by default. So the tests still pass, whoo. Though it isn't actually being tested, but that's also happening for the other conditional XDG items. Not your fault, and that should be fixed elsewhere. This does make Dolphin's placesitemmodeltest fail though, since it's smarter and by adding a new item the expected counts are now all off. Since apps have been branched, that could be fixed on master without the need for ifdefs. Though I'm accepting this now, please wait for approval from some other people too, like @elvisangelaccio. davidc added a subscriber: davidc. Just wanted to say thanks for this. Adding Documents is the first thing I do when I open Dolphin on a fresh install. FAIL! : PlacesItemModelTest::testDeletePlace() Compared lists differ at index 2.
acrouthamel mentioned this in D16967: Add Documents shortcut detection. Ok, I created D16967. Thanks! 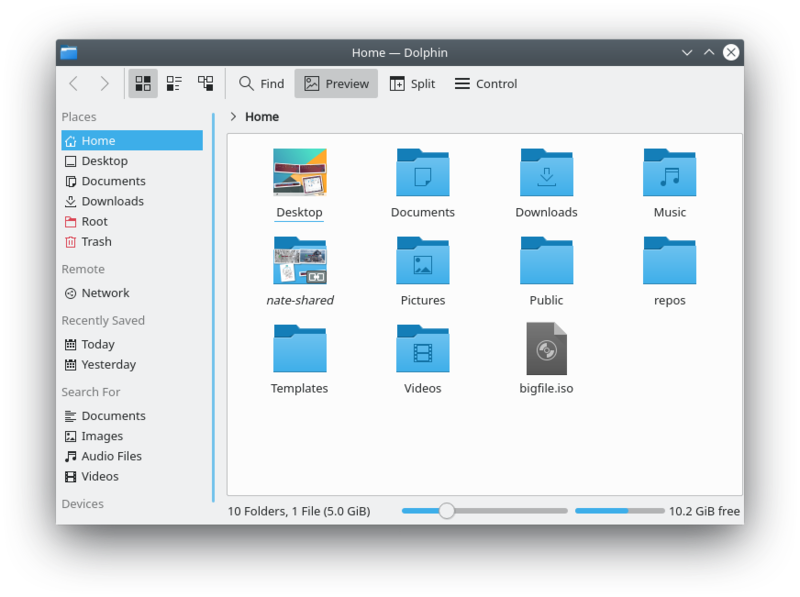 Do you think you could also submit a Dolphin patch that makes the default size of the window a little bit taller too? I know it's silly to be concerned about a scrollbar, but it would be nice not to have it with the default view, especially since we haven't yet fixed https://bugs.kde.org/show_bug.cgi?id=301758. I looked into fixing that once but concludes that it was almost impossible with the current implementation, which synthesizes its own scrollview from scratch. I think fixing that will require T9795: Use Places Panel code from KIO instead of private implementation. I wasn't suggesting that you fix T9795 (it's beyond me too! ), but rather than you could tackle the patch to make Dolphin's default window size a tad taller.